This miniature replica shows three prisoners of war playing the lyre while they are being led into captivity. The limestone relief is from the Palace of Sennacherib, king of Assyria at Nineveh his capital. It is from the seventh century BC. The original is located at the British Museum. - Alabaster relief from the palace of Sennacherib at Nineveh, his capital. - Three captives (possibly Hebrew) are playing instruments, the lyre. - The Assyrian soldier is forcing a song, carrying a club and a quiver. - It was common for Assyrians to require songs from captives. - The captives are barefoot, wearing tunics, 2 are wearing head coverings with headbands. - The lozenged background shows that it was in a wooded area or forest. 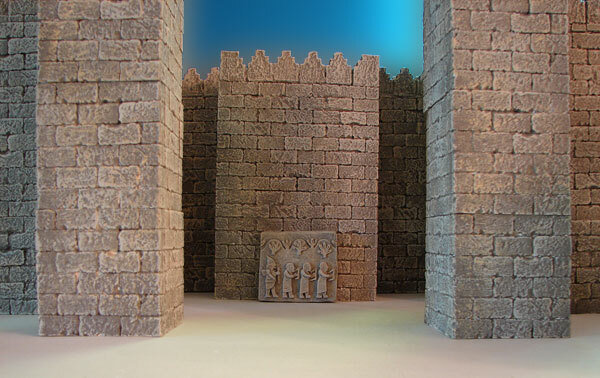 - The detailed relief stands 99 cm (3.24 feet) tall. - Sennacherib reigned from 705-681 BC. - The event took place during Sennacherib's reign. - This wall panel is from the Neo-Assyrian Period (1000-612 BC). - Excavated at the site of ancient Nineveh (Kuyunjik). 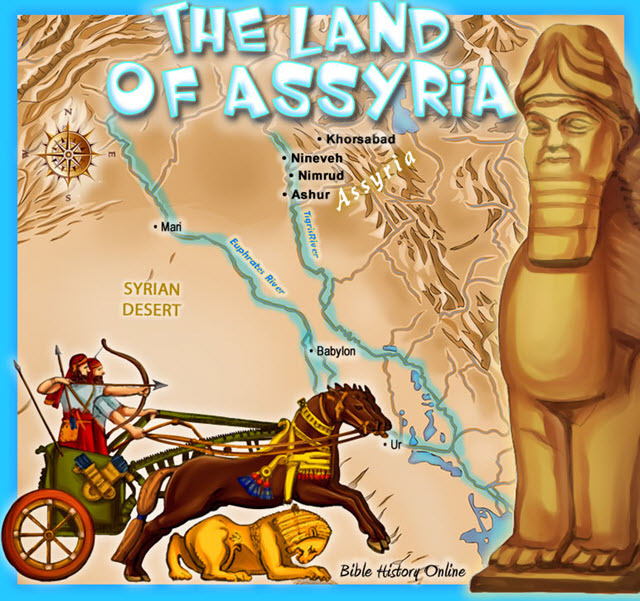 - Ancient Nineveh was excavated by Austen Henry Layard of Britain around 1849. - This stone panel is currently at the British Museum. - Nineveh (Kuyunjik) was Sennacherib's capital city (Northern Iraq). This is one small surviving fragment from a much larger composition. The scale effect on the background represents rough ground. The musicians are often thought to have come from the state of Judah, though there is no evidence for this. 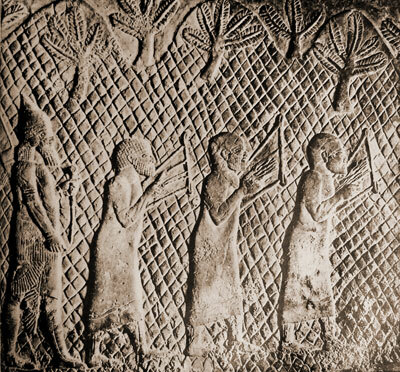 The style of their dress is different to that worn by the people of Lachish (see for example, a panel showing the siege of Lachish). They are, however, almost certainly Western or Levantine in origin. 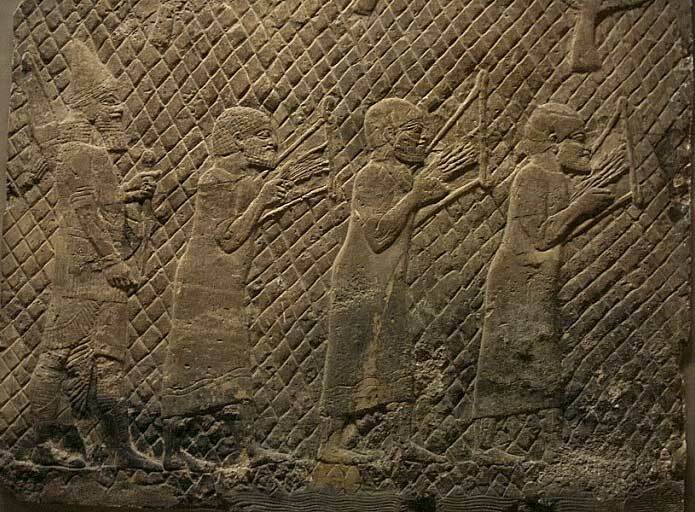 Music was clearly an important part of court life and Assyrian kings often refer to taking musicians into captivity as part of the deportation of defeated peoples. There is evidence of music in religious practice at an earlier period, but reliefs like this provide the first images of musical instruments in an ancient Near Eastern society that are not connected with a religious ceremony. The musicians are playing lyres. They hold them more or less horizontally and use a plectrum. This type of lyre was possibly introduced into Assyria from the West in the first half of the second millennium BC. Only a few are known and the chronology and classification of the many forms of lyre in the Near East in the first millennium is neither complete nor certain.